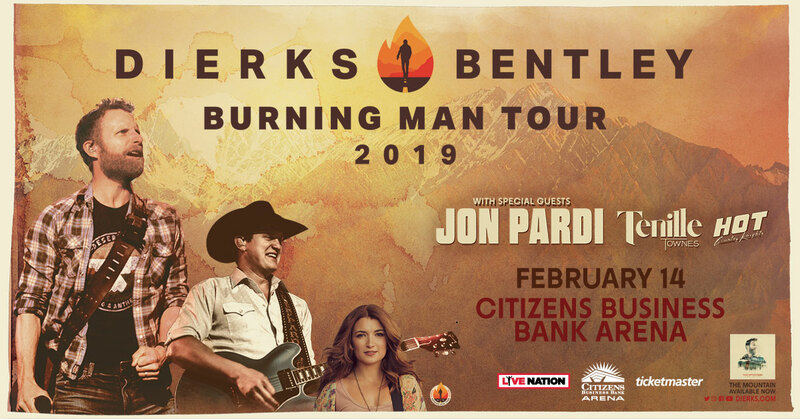 Listen all week for your chance to win tickets to see Dierks Bentley at the Citizens Business Bank Arena on February 14th, 2019. Listen all week for your chance to win tickets to see Dierks Bentley at the Citizens Business Bank Arena on February 14th, 2019. Tickets on sale Friday, December 7th at 10am. Giveaway to run Monday, December 3, 2018 at 12:00 AM through Friday, December 7, 2018 at 8:00 PM. A winner will be selected each time when they are the 25th on-air caller unless otherwise stated on-air by the announcer. If there is a grand prize winner offered for the week long contest, the grand prize winner will be randomly selected from all of the weekly contest winners on the first Monday after the contest has concluded. 20 prizes to be awarded over the contest. Value for each prize is $50. Grand prize winner will be contacted directly by the Go Country 105 promotions department. All other Go Country 105 contest rules apply.